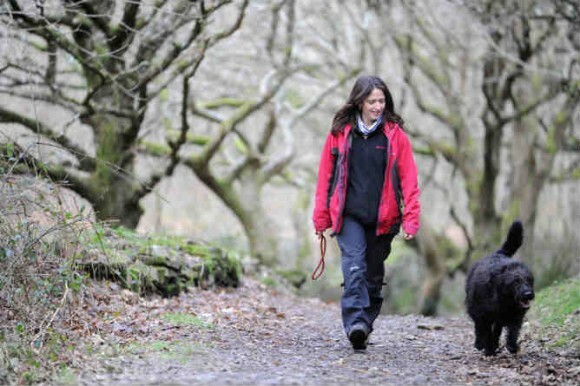 With the right preparation and kit, you and your dog can learn to love your winter walks. When walking in the dark, keep your dog on a lead and try to stick to routes with wide pavements and street lights. If you do encounter unpaved areas, walk against the flow of traffic, keeping your dog on the side farthest from the road. Parks and sports fields can be ideal exercise areas, but check that dogs are welcome. In case your dog strays, ensure he is microchipped and his ID details are up to date. High-visibility gear for dogs and owners will help motorists to see you on dark nights and murky mornings. Putting a reflective, flashing collar with a bell on your dog will enable you to see and hear him easily, particularly when he is off the lead. Always carry a torch so that you can see where your dog is toileting, and consider wearing a head torch to keep your hands free. Wrap up warm by wearing lots of layers and invest in a good waterproof pair of walking boots and thermal socks. Buy the best quality coat you can afford and top it off with a warm pair of gloves, scarf, and a hat that covers your ears. An extra pair of gloves and hand warmers in your pocket can provide additional warmth. When driving in the depths of winter, avoid leaving your dog locked in your car — you are effectively leaving him in an ice box making him vulnerable to hypothermia. An umbrella, waterproof coat, and plenty of dry towels and blankets in the car will help to keep you and your dog warm and dry. Invest in several different weights of dog coats and keep a spare one in the car to pop on your dog for the return journey home if he is cold, wet, and muddy. Never allow your dog to walk on frozen ponds, as the ice might not be thick enough to take his weight. If he does fall through the ice, don’t be tempted to go in yourself, but keep calling him and encouraging him to swim back towards you. Mud and rain are unavoidable aspects of winter, but if the thought of all that dirt makes you feel stressed, look for ways to keep your house and car as clean as possible. Dirt trapper mats that absorb mud and moisture are available to place in doorways, and keeping a stack of old towels beside the kitchen door will enable you to dry your dog’s feet and fur gently before he goes inside. To protect your car, place old blankets or towels inside the boot or buy a special, washable boot liner. Avoid having your dog’s coat cut short during the winter months. Trimming the hair around his feet will help to prevent the build-up of ice balls between the pads and toes, which can be really painful. If your dog starts lifting up his paws, whining, or refusing to move while you are out on walks it could be because his feet are too cold, so it might be worth investing in some protective boots for him. Beauty spots that are normally packed with summer tourists are often blissfully quiet in winter. Keep your spirits up by exploring these areas on some brisk walks, as this will increase circulation and improve your mood — far better than hibernating until spring! Dogs inevitably spend more time indoors during winter, with less exposure to sunlight, so when possible walk during daylight hours or arrange for a dog walker to help. Walking through snow and mud means that you and your dog have to lift your legs higher and expend more energy. Ensure that you both have plenty of water to drink, and don’t ask older dogs to do too much during extreme conditions. Burning all those extra calories will enable you to enjoy a nice guilt-free hot chocolate when you get home and indulge your dog with a few extra treats. Check the forecast before setting out on a walk so that you are prepared for the conditions. If snow starts to fall heavily, recall your dog and put him on a lead, as snow can affect his sense of smell, disorientating him and putting him at risk of losing you. If travelling in a car, ensure basic winter safety checks have been made before you leave home. On long trips carry an emergency first aid kit, a shovel, mobile phone, blankets, and a flask containing a hot drink. After each winter walk, towel your dog dry and check his coat and pads for stones or hardened mud. If necessary use warm water and cotton wool to gently clean between pads and toes to prevent salt and ice from causing irritation. Avoid very hot water, which could cause discomfort and give your dog chilblains. If your dog’s pads do become cracked, coat them with a soothing pet-specific foot balm. Last PostWhy does my dog eat grass?Next PostHelp! My dog is obsessed with toys!